You can earn 32 PawPoints on this product! Containing 40% salmon as the main ingredient, CP All-Rounder boasts 22% protein with a great 14% fat content to provide all the necessary 'fuel' for your champ's daily activity. 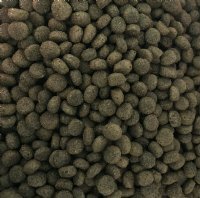 These easy-to-crunch, little round 'balls' measuring 9mm x 13mm, are highly palatable and appeal to all breeds while providing top quality nutrition. Containing 40% Salmon (24% freshly prepared salmon & 16% salmon meal) with a good fat content and superior joint support, this hypo allergenic recipe has been formulated to promote muscle tone, vitality as well as excellent skin and coat condition. 40% Salmon, Whole White Rice, Maize, Beet Pulp, Chicken Fat, Salmon Gravy, Brewers Yeast, Dried Egg, Linseed, Minerals, Vitamins, Grape & Olive Extract, Glucosamine, MSM, Mixed Herbs, Chondroitin, Marshmallow Root, Yucca. Vitamins: Vitamin A 30,000 iu/kg, Vitamin D3 2,000 iu/kg; Vitamin E 200 iu/kg; ZINC 48 mg/kg, IRON 48mg/kg, MANGANESE 35mg/kg, COPPER 12 mg//kg, IODINE 0.96 mg/kg. "I hope you dont mind me sending you a couple of pictures from yesterday with daisy getting a certificate of merit at the Worcester open test. Very pleased with her since putting her on Cp all rounder and focus herbs the change in her has been amazing. As it hasnt been released yet there cant be many dogs that have gained awards after being fed All Rounder! !